Labyrinth pattern from Chartes cathedral. The labyrinth is not a maze. There are no tricks to it and no dead ends. It has a single circuitous path that winds into the center. The person walking it uses the same path to return and the entrance then becomes the exit. The path is in full view, which allows a person to be quiet and focus internally. Generally there are three stages to the walk: releasing on the way in, receiving in the center and returning; that is, taking back out into the world that which you have received. There is no right way or wrong way to walk a labyrinth. Use the labyrinth in any way that meets what you need. 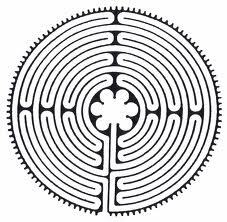 The labyrinth design we have is a replica of the 11-circuit labyrinth of Chartres Cathedral in France. This pattern, once central to cathedral culture, was inlaid into the stone floor in 1201. The labyrinth is an ancient pattern found in many cultures around the world. Labyrinth designs were found on pottery, tablets and tiles date as far back as 4000 years. Many patterns are based on spirals from nature. In Native American culture it is called the Medicine Wheel and Man in the Maze. The Celts described it as the Never Ending Circle. It is also called the Kabala in mystical Judaism. One feature they all share is that they have one path which winds in a circuitous way to the center. Labyrinths are currently being used world-wide as a way to quiet the mind, find balance,and encourage meditation, insight and celebration. They are open to all people as a non-denominational, cross-cultural tool of well-being. They can be found in medical centers, parks, churches, schools, prisons, memorial parks and retreat centers as well as in people’s backyards. There are many ways to describe a labyrinth. It is a path of prayer, a walking meditation, a crucible of change, a watering hole for the spirit and a mirror of the soul. May you be nourished. The Labyrinth is an ancient spiritual practice for the purpose of prayer and meditation. Whether you walk the Labyrinth or prefer to sit quietly in the space, you are welcome to come receive the refreshment of God. It takes 20-30 minutes to walk the Labyrinth and there is a brochure available with practical suggestions for walking the Labyrinth for those who are new to the practice. Come receive the blessing of God’s healing Spirit. The Labyrinth at First Christian Church Pomona is open on a periodic basis. Call the church office for a current schedule (909) 622-1144 or see the church calendar.